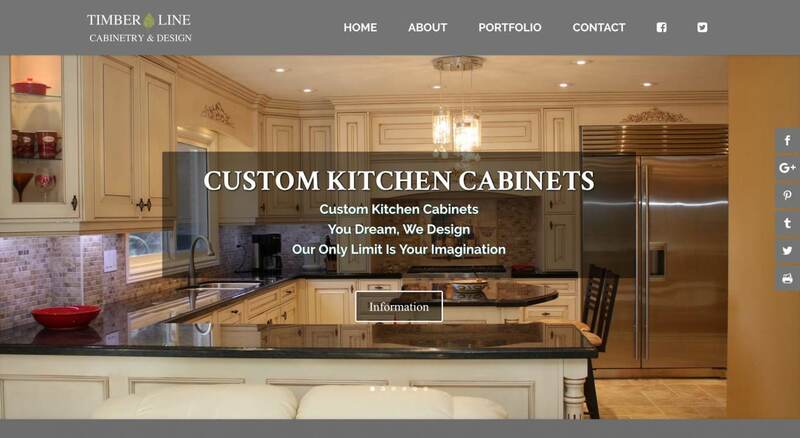 Timberline Cabinetry & Design has launched their new website. Created by Team 218 Web Design, the site is responsive and serves to showcase Timberline's products, services and design capabilities. When I started this journey, I knew I wanted to work with great quality products that I could offer at a reasonable price for my clients. In searching for a quality product that was durable and reliable, I came to find the Amish cabinets. The Amish cabinets are constructed of all wood (no particle board) for a solid cabinet construction. If you are building a new home or remodeling an older home, we can supply you with all of your cabinet, or trim needs. We can make custom moldings, mantles, stair cases, window headers, built ins, and baseboards to match something from an old victorian home, or create something new from a vision. We can match stain and paint color from something existing or create something new. Maple, oak, hickory, poplar, pine, cherry, walnut, lyptus, elm, and bamboo are just a few of the wood species we use. There are quite a few components to planning a kitchen and making everything come together at the end. We work with the most knowledgeable people in the area for granite/quartz counters and appliances, and we can help to coordinate these items with your cabinets. We also have two teams of installers, who specialize in cabinets and trim. If you have any questions at all, please feel free to use my contact form on my website.